Today I leave for a whirlwind work trip to Europe. Thought I'd take the opportunity to share some of my must-haves on the long-haul plane trip to help make it that little bit more pleasant. 1. my Georgie Cummings purse full of important stuff like money and credit cards. 2. a good book. This trip I'll be reading The Great Gatsby as I have never read it before (!). 3. a pen for arrival cards and customs declarations. 4. some inspirational reading, in this case Wayfare magazine. 6. my favourite perfume (Stella McCarteny's Stella) in a cute handbag size for a quick freshen up. 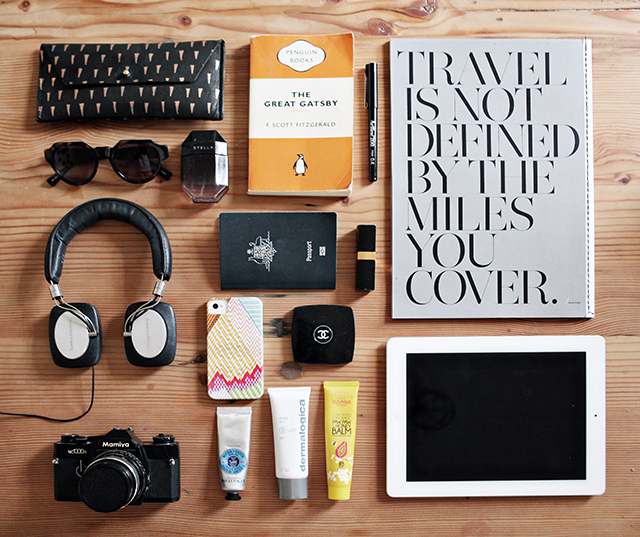 7. probably the most important - my passport. This one is brand new and ready to be filled up. 8. Chanel lipstick, again for a quick freshen up. 9. a quality set of Bowers & Wilkins headphones that block that pesky airplane noise out. 10. my trustie iPhone, 'cause everything is on it. 11. a Chanel compact mirror, so I can apply the above lipstick. 12. another trustie Apple product - the iPad. 13. a camera. For this trip I'll be taking an old analogue film camera. It's been a while, so I will be interested to see how my photos turn out. 14. finally, moisturiser for my hands and skin and some Suvana paw paw lip-balm so I look and feel semi-descent at my final destination. Love the sunglasses, where did you find them? Looking for a new pair myself.